How does creativity and opinion on the web affect the mainstream? And how is the mainstream trying to use the web? Those were two of the issues under discussion at the Beyond Broadcast conference in Boston this week. If you want to understand the future of political participation online ask a ninja. That was, much simplified, the claim made by one of the web's leading thinkers on media and democracy. 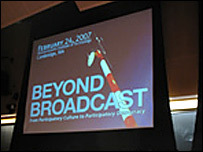 Henry Jenkins, director of comparative media studies at the Massachusetts Institute of Technology (MIT), was speaking at the opening of the Beyond Broadcast Conference in Boston. The event, organised by figures from Harvard's Berkman Centre for the Internet and Society and MIT's Media Lab, examined how participative technologies are changing politics and the media. Mr Jenkins was referring to a popular YouTube video that has gone from niche viewing to populist impact. Even in a US primary election season, where would-be presidential contenders raced to announce their candidacy in online videos, Mr Jenkins' keynote speech was an eye-opener. The point, set out more fully in his book Convergence Culture: Where Old and New Media Collide, is essentially this - that politicians should not ignore the fun, frivolous side of the net because the web enthusiasms of the young: games, online video, machinima and mash-ups are the new online-tools that sooner or later will be used for political purposes. As Mr Jenkins told me: "No sooner is a tool put out than it's taken up by citizens and turned to political use. "Part of what we're seeing is a new language of politics which connects the popular culture because that's the framework of reference for speaking to a younger group of citizens and changes democracy in a fundamental way"
Consider the role YouTube played in the last US elections - with clips of candidates embarrassing moments instantly posted by an army of videobloggers. The mid-terms also saw politicians engaging with the virtual world Second Life. "We're going to see more and more politicians taking part in Second Life. 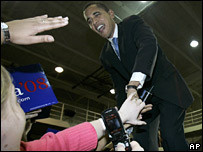 It's all kinds of politics which uses as its basis the passion and commitment we have to popular culture", Jenkins said. The Ask a Ninja video with which Mr Jenkins closed his keynote neatly encapsulates the arc of the argument. 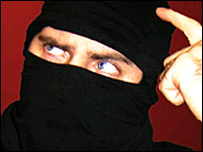 Ask a ninja is a series of videos where a man dressed as a ninja gives his own fast-paced take on a particular question. Jenkins showed the ninja's network neutrality video. Network neutrality is a concept that underpins the internet, where everyone has the same level of access to the web and that all data moving around the web is treated equally. Some US telecoms companies have threatened the concept, calling for a two-tier system, where data from companies or institutions that can pay are given priority over those that cannot. The ninja's save the internet campaign video, created by comedians Kent Nichols and Douglas Sarine, was viewed 500,000 times according to YouTube, figures that dwarf the numbers for videos created by mainstream political parties. Mr Jenkin's argument was mirrored by comments of other political big hitters at the conference. Zephyr Teachout of the Sunlight Foundation and formerly the director of internet organising for the Howard Dean campaign said: "there are a few big changes - one is in the new importance of video." But Ms Teachout raises an interesting question about authenticity. "Each campaign is going to have a fascinating ride as they figure out how to incorporate citizen and their own media, how to communicate as an authentic candidate without seeming like a fake authentic candidate." In other words, crudely aping edgy online viral videos can turn voters away rather than engage them: the online equivalent of a "disco dad". It also leads to a campaign in which the candidate's election teams have much weaker control over grass roots created content. "A lot of the exciting political speech and political action is going to happen outside of the campaigns with supporters who aren't necessarily tethered to the campaign," said Ms Teachout. Edgy content can alienate sections of the electorate. For that reason Jenkins thinks it is to the campaigns advantage if there is some distance from the candidates themselves. "It may not be that we want the next John McCain or Barak Obama to be doing parody videos on the web, but citizens groups will be doing it on their behalf and I think they'll have plausible deniability"
Yet with all the focus on the new media, particularly that primarily used by the young, it's easy to overlook the online presence of an older constituency on the web who exercise great political power. Take Britain's recent experience with a large online petition against road pricing. Writing in her blog Hitwise Intelligence Analyst Heather Hopkins says: "Almost half of visitors to the e-Petitions website (47%) in the past four weeks were aged 55+, and this group is 128% more likely to be on the e-Petitions website than average." That's a result echoed in earlier research by Joseph Graf at the Institute for Politics Democracy and the Internet. He shows that the average age of political blog readers is 49 - a valuable online constituency politicians need to harness but too old to be a ninja perhaps.